As many of you know, I have battled both Ulcerative Colitis and Crohn's Disease since I was 16 years old. I am currently maintaining fairly well on a small dosage of a steroid called Entocort. Though I would love to not be on it at all, the other options aren't pretty. I am happy that the Entocort is doing its job. I do pray that some day in my lifetime there will be a cure for Crohn's Disease and Ulcerative Colitis. Today, by a pure mishap I met a heroic women who is running two half marathons and trying to raise $10,000 for the Crohn's and Colitis Foundation of America. Her Husband has also struggled with both Colitis and Crohn's. Please visit her website and consider giving to her wonderful cause. Let's all help find a cure for these debilitating diseases. Our monthly Craft Club met last night. Tia showed us her talents for painting, papering and modge podging wood items. Here are the two things I made. I used the new Bella paper packet from Close To My Heart's Summer Idea Book which "arrives" on May 1st! All other products on the pieces are from CTMH as well. I'm in love with the little birdie. Thanks Tia for your inspiration! Last night Kenny and I decided to check out the Skagit Valley Tulip Festival. We got up this morning and took a little drive up north. The sun was partially out which made for nice picture taking weather. It wasn't very warm, but at least it wasn't raining! Shane really enjoyed smelling the flowers. He also really liked the tractors that went by for tours and the big kites they had flying. We even got to see our friends: Julie, Dama, Lucas and Ellie! Shane and I made a stop at Fred Meyer this afternoon. I realized that I might be able to find a lawnmower for him. At first it didn't look so good, but a nice lady found them for us. I had told Shane what I was looking for and he was really, really excited. When we found it he told me to put it next to him in the cart seat. Then he wanted the box to be next to him for the ride home. He giggled every time I told him we were going home to play with his lawnmower. When he was mowing he asked if he could mow the flowers. I think he really thinks he is cutting the grass like Daddy. He is one happy little mower. This first video is Shane acting out a book called Swing. One night he had asked for Kenny to act out the book. After that night he wanted to get into the action and now can do it all on his own. He motions have gotten even better since this taping. We do it EVERY night now. This may be considered mean parenting on our part. For a week or so, Shane had been asking to read a book called Albert and Amy. It is all about opposites. The last page says "Albert is sad." and "Amy is happy." One night while reading it, Shane burst into tears when I said "Albert is sad.". I thought he had hurt himself. After he was calmed down, I read "Albert is sad." again. More crying. I quickly figured out he crying was for Albert. Kenny grabbed the video camera and I read it one more time so we could catch it on tape. We had family pictures taken Easter weekend and we just got a sneak peek of them. I can't wait to see the rest of them!!! Shane desperately hates when the sun is in his eyes. This afternoon we were headed out the door to stroll over to the neighbors to play. I grabbed his Mariner's hat and told him if he wore it, it would keep the sun out of his eyes. He has never wanted to wear it before. Low and behold, he wore it for 3 hours straight. Guess he figured hats had a purpose if they block that darn sun out of his eyes. May is National Scrapbooking Month and Close To My Heart is celebrating it with a wonderful kit called Tickled Pink. It's a darling scrapbooking kit that includes the new D-size My Acrylix I Am stamp set, textured cardstock, B&T Duos™ paper (2 with glitter! ), Mini-Medley Accents White Daisy collection, a foam texture tool, and an instruction brochure for creating two beautiful two-page layouts. If you aren't a scrapbooker you can use this for any other project like card making or altering. I had so much fun putting it together. I have been wanting to scrapbook more about myself and this kit helped me do just that! 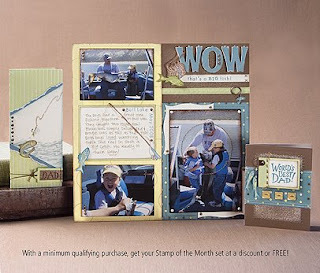 *Place a minimum order of $60 in stamp sets (excluding K-size or Stamp of the Month) and receive it for FREE. *Purchase the Tickled Pink scrapbooking kit at just $34.95. *Sign up as a new Consultant between May 1-May 31 and receive a kit for FREE. *Host a gathering with a minimum sales of $00 and receive the kit for FREE. Offers run through May 31st. While Supplies Last! The Events of a Sunny Sunday. Another sunny weekend in the Northwest! Spring fever is truly upon us! As well as those dreaded allergies. This morning the family headed out to Magnuson dog park. Dodger had to stay in the car due to his poor social behavior. Sadie on the other hand got to run free and frolic in Lake Washington. Thanks, Sadie for showering us with the cold lake water!! Shane got to hit the playground afterward and do some kid observing and playing. Later in the day we got ourselves a new lawn mower. Which has quickly become Shane's new most favorite thing in the world. (It use to be the vacuum). Since he doesn't have his own sized lawn mower (yet), he had to improvise and bring out his vacuum. He watched with saucer sized eyes the whole time Kenny mowed the lawn. He narrated every move that Kenny made and continued to tell me how the lawn mower sounded. We may have a novelist on our hands? This week I finished The Story of Edgar Sawtelle by David Wroblewski. Man, what a book! It was slow going at first. I actually started reading it in December. I just wasn't getting hooked, so I put it down until a few weeks ago I picked it back up. I finally got into it, though it was still a really long and hard read. Probably one of the hardest I can remember in a long time. It was full of twists and turns. Very mysterious and most of the events in it just caught me off guard. When I finished it, I kept walking around shaking my head in disbelief. I don't read books over, there are just to many out there to read, but I could see myself reading this one over again. I think there were a lot of little details that I didn't catch the first time. I would recommend it, though it was a long haul. It evolves dogs, which was part of the reason I did like it. I think if Shane could tell me he would say this is his idea of heaven. Watching "Signing Time" while sitting on his favorite thing to play with, the vacuum. He gets 30 minutes of TV a day. He chooses to watch "Signing Time" usually right when he gets up in the morning. The afternoons can be hard because mean old Mom won't let him watch it again. He knows 30+ signs at this point. Which come in very handy since he knows about 5 words right now. If that. Some day he'll talk and I'm pretty sure when he starts to do that we won't ever hear the end of him talking. Since he "talks" non-stop right now with out "words", I'm sure he'll be a talker when he has them. These are the 4 cards we'll be making during the spring card making class this Saturday. I have 2 spots still opened if you would like to attend. The class fee is $5 for all 4 cards! If you can't make it to this class, but are interested in attending a workshop visit my Event Calendar at http://jessicabooth.myctmh.com/. This morning Shane, Dahlia and I visited the Kids Quest Museum. They have an area for birth to three year olds. Plus, a water area, the front of a semi-truck, a music area and a science area. They had so much fun. I must say the water area was the hit of the day. I loved watching them try to figure things out. You could really see them problem solve together. They were soaked through by the time we left. On a side note...I got part of my garden planted this afternoon. A big thanks to Betsy for the starts. I have 4 lettuce plants, 3 red lettuce plants and 3 spinach plants. I planted my little container garden to the max. I'm going to have to expand this year to more then one container. I still need to get a tomato plant and I really want to try carrots. How fun would it be to watch Shane pull a carrot out of the ground for the first time!!! Shane and Dahlia had quite the time this afternoon stomping in mud puddles. These things look like small swimming pools. The sun came out right as we got to the puddles and made for a wonderful, fun stomping session. Dahlia jumps right in...Shane watches to see if it is safe. What a gentleman. Join the National Scrapbooking Month celebration in May with this special Tickled Pink offer. It's a darling scrapbooking kit that includes the new D-size My Acrylix I Am stamp set, textured cardstock, B&T Duos™ paper (2 with glitter! ), Mini-Medley Accents White Daisy collection, a foam texture tool, and an instruction brochure for creating two beautiful two-page layouts. You will be Tickled Pink during this campaign. Offers run through April 15th - May 31st. While Supplies Last! A playful fishing motif makes this set perfect for any man who loves tossing out a line. Available only April 1-30th. Shop online at https://jessicabooth.myctmh.com for discounted CTMH products. You will find a variety of paper packets, accessories and discontinued items at great prices. Saturday, April 18th at 7pm -- Card Making Class -- We'll be making 4 cards (Mother's Day, Father's Day, and 2 Spring Any Occasion). The cost is $5. I have only 3 open spots left. If you would like to attend this event, please email your RSVP to me. Friday, May 1st -- Summer Idea Book is available!! Book your gathering or place an order of $20 or more and receive your Summer Idea Book for FREE!! Saturday, May 9th at 7pm -- Scrapbooking Class -- We'll be making 2 12x12 Spring themed layouts. The cost is $5. I have only 2 spots left for this class. If you would like to attend this event, please email your RSVP. Monday, May 11th at 1pm -- Card Making Class -- We'll be making 4 cards for any occasion. The cost is $5 and kids are welcome! I have 6 spots open for this class. Email me to reserve your spot. Saturday, June 27th at 6pm -- Workshop on the Go -- Leave this workshop with 8 completed 12x12 pages, as well as, extra paper and embellishments to make other pages and cards! The cost will be between $23-$25. There are 5 open spots for this class. Email me to reserve your spot. Have you ever considered attending a scrapbook retreat? I did last year and had the best time of my life! There are spots available for you to join me at The Keepsake Cottage in Auburn on September 11th-13th, 2009. If you would like more information, just let me know. It was a rainy, rainy and cold Easter in the Northwest this year. Not so great for egg hunting outside. We made due with the living room. The morning started out with Shane coloring easter eggs for the 1st time ever. He seemed to enjoy the process and took it very seriously. A little later after the Easter Bunny hid the easter eggs in the living room, Shane came out to find them. He wasn't so sure to start out that finding eggs was something he wanted to do. After a few minutes of coaxing and helping him out, he decided that this egg hunting thing wasn't so bad after all. Grandma and Grandpa Hussey came over from Sequim to celebrate Easter with us this weekend. We had a yummy dinner together. Kenny and Shane finished the Easter evening off with Grandma's Berry Pie. The top picture Shane is signing for "more". He loves himself some Berry Pie!